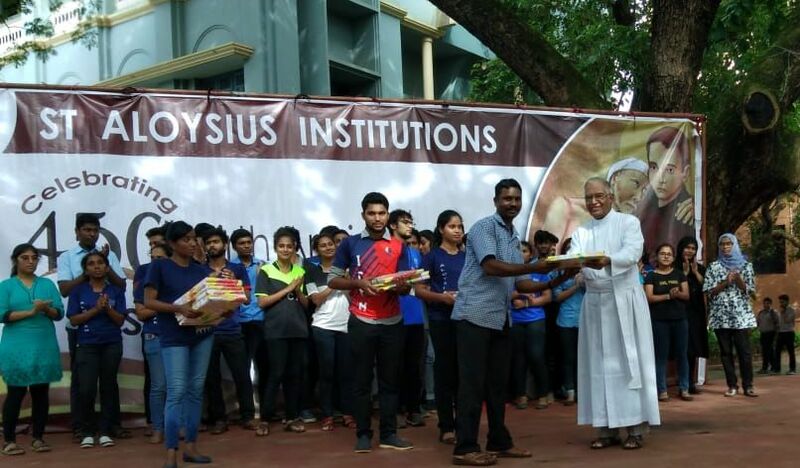 St Aloysius College (Autonomous), Mangaluru held a one-day programme on “Love for Labour” on 24 August, 2018 in the College Campus. 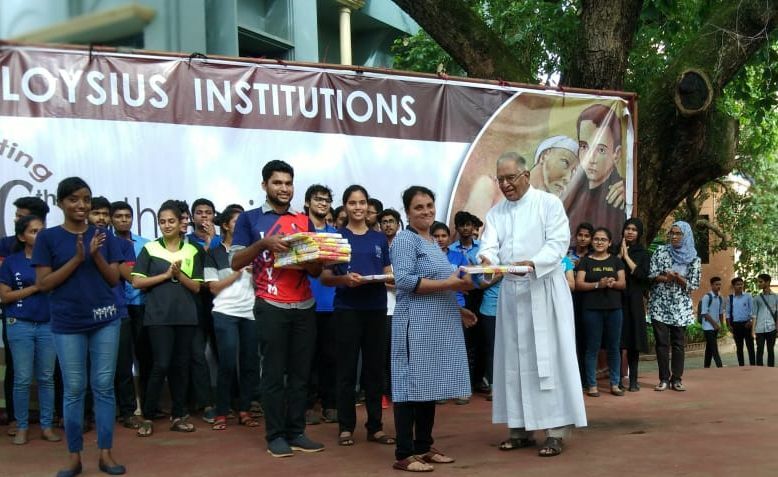 This programme is a part of the week-long programme ‘SEVA SAPTHAH’ organized to commemorate the life and selfless service of its Patron, St Aloysius Gonzaga during his 450th Birth Centenary Celebrations organized by the College. 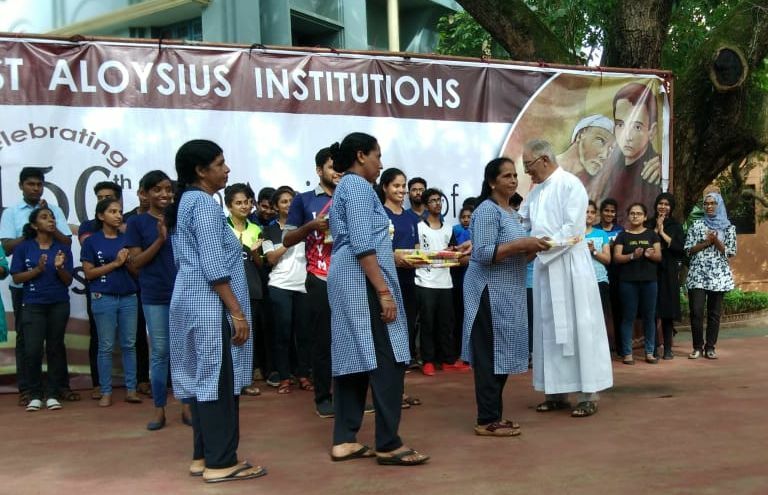 During this programme, the students took part in cleaning the campus by substituting the support staff of the college in their work for a day. The students cleaned the different places of the campus and experienced the pain of the support staff in cleaning the campus. This is a new concept initiated by the Students Council and several students took part in this programme. Besides this, gifts were given to the Support staff by the Students Council. They also arranged a competition. 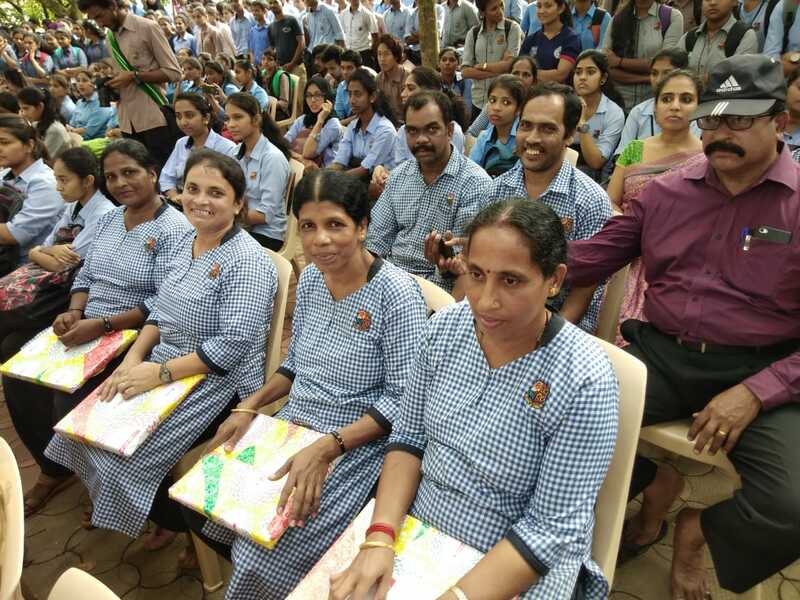 ‘Best Clean Classrooms’ of different blocks were awarded prizes. Fr Pradeep Sequeira SJ, Finance Officer was the Chief Guest for the valedictory of the above programme. He encouraged the students to take noble initiatives like these. He also said that the real meaning of satisfaction lies not in receiving but in giving or sharing. Prinipal, Rev. Dr Praveen Martis SJ, in his address, applauded the efforts taken by the students to organize such a meaningful programme in the college. He said that this is totally a new concept initiated by the Students’ Council and appreciated the hard work taken by them. Mr Anup Denzil Veigas, Dept. of English briefed about the programme. Principal, Rev Dr Praveen Martis, SJ welcomed the gathering. Pia Menezes compered the programme. Labour has always played a crucial role in the making of human history. From early times of the “hunter – gatherer humans” to our own “postmodern time,” the history of labour has been a long journey of extraordinary human effort that shaped the world we inhabit today. However, the chain of economic activities that supports and runs the giant system called capitalism has become so complex, that we cannot easily understand its working mechanism that determines our life. The things we see around us; the buildings, roads, automobiles and commodities appear to us only as different forms of money and not as products of human labour. This is the tragic paradox of the “Consumer Society” we belong to. As greedy consumers, we often unconsciously transform all living and non-living forms by objectifying them as commodities. This tendency of commodification has turned labour too into a commodity that can be appropriated into the technological processes of production. In such a scenario, it is very important to remind ourselves the significance of human labour and try to uphold the dignity of the working classes. When our institution celebrates the 450th year of the birth of St Aloysius Gonzaga as jubilee week, under the name of “SEVA SAPTHAH,” the Students’ Council of our college has decided to dedicate this day, 23 August 2018 to the cause of service through work. Members of the council showed solidarity with the support staff of the college by substituting them in their work for a day.